Onuma IPA by Onuma Brewery is a beer that we’ve had before but were unsure of it. It’s an India pale ale brewed with an 30% more malt that usual and weighs in at 8%. 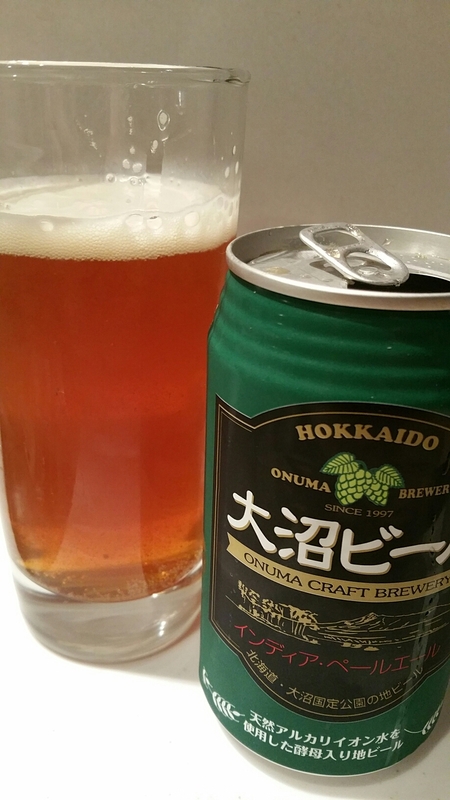 Our first tasting of Onuma IPA was in Hokkaido in 2013 on a drive across the island. Not an American IPA by any means so don’t go in expecting massive hop flavours. Onuma IPA poured out a light brown colour with a wee amount of head yet, after a recent discussion about IPAs and expectations, the aroma is far yeastier than I had expected. It wasn’t on a mouldy level of pungency, yet, if you’re going to drink Onuma IPA and expect hops and citrus notes, you’ll be disappointed. The yeast notes did mask the citrus notes I had expected and were so succinct, it would have been easier to find Wally/Waldo. With such a subdued entrance, Onuma IPA was even more confusing in the body. After the intriguing aroma, the expectations of an IPA had dissipated faster than the head. An underlying sweetness to Onuma IPA balances with the yeasty creaminess that had a smuckering of malt as well. Quite beguiling as it felt more like a scotch ale or even a barley wine than either an English or American IPA. This doesn’t mean Onuma IPA is bad, it’s just hard to classify it as an IPA when it doesn’t tick any of the boxes.